12) a dried lemon pierced with a knife (whole)–substitute with half a lemon cut into thick slices. Marinate the chicken with 1 tsp of cumin, coriander, 1/2 tsp of ground cinnamon, cayenne (or paprika), lemon juice, 1 tsp of balsamic vinegar, 1 tbslp of olive oil, salt, pepper, and 1/4 tsp of turmeric and leave in refrigerator for 2-3 hours. In a pot under medium heat add the rest of the olive oil, onions, salt and cumin. Sautee until browned. Add the rice, and fry a little–about 1 minute. Add the dried lemon, green chilly pepper, cumin, coriander, cinnamon, and pepper, and add 1 cup of water. Cover and let cook under low heat. Once the water has dried (the rice will not be cooked through yet), turn off the heat. Now take a piece of non-stick foil big enough to accommodate both the rice and chicken. Spoon all of the half-cooked rice and place the two pieces of chicken on top. Wrap the foil around the chicken very well, leaving no opening whatsoever. Place as is, under a broiler (at medium) for an hour and a half. After that time, take out of the oven, and make sure the rice is cooked through. 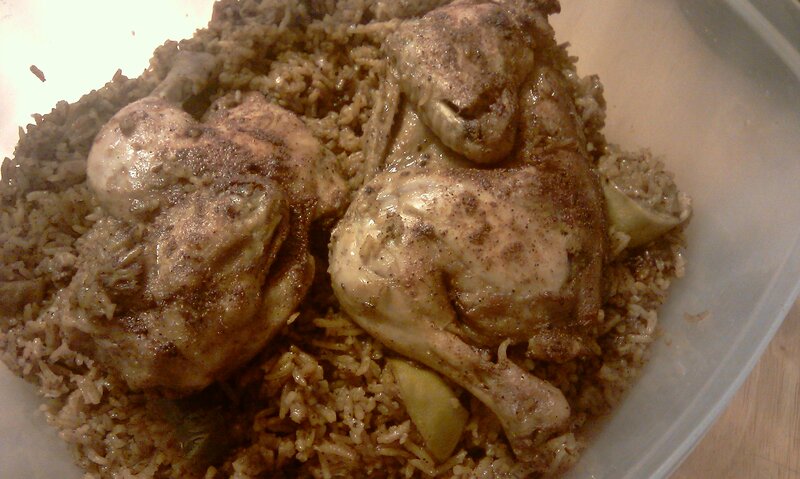 If so, then spoon the rice onto the serving platter.Place the two pieces of chicken under the broiler to brown on top. Serve immediately with a green salad and yoghurt.